he country best known for Port, Madeira and corks is often overlooked when consumers think of red and white still wines – but take note! The table wines of the region have improved dramatically in the past few decades. The winemaking areas trickle down the country’s narrow shape, bordered by the Atlantic on the west and Spain on the east. Furthest to the north lies the region Minho, which produces the slightly spritzy white wine, Vinho Verde. Translated, it means green wine, not because the wine is green, but because it is meant to be drunk in its youth. Vinho Verde is a light, refreshing wine, low in alcohol and with a slight spritz. It can be made with a number of grapes, but the best whites are made with Alvarinho (same as Spain’s Albarino). Red Vinho Verde exists too, but not much on the export market. For other red table wines, the three most common regions are the Douro, Dao, Bairrada and Alentejo. In the Douro, home of Port, red wines are made from the primary port grape, Touriga Nacional, as well as Tinta Roriz (Tempranillo). Still red wines from the area are good quality and contain fruity, spicy notes. The Dao and Bairrida areas use Port grapes, as well as the local Tempranillo clone. They produce high quality, good value red wines. Bairrida also makes a few sparklers. Alentejo is a super big and super hot region in the south of Portugal making reds and whites. Portugal has built its reputation on fortified wines and for hundreds of years, Port and Portugal have been synonymous. But too often overlooked are the still, dry wines of the country. With over 250 indigenous varieties, different climates, soils and with sustainable practices, Portugal is an untapped haven for still wines. They are incredibly food friendly, and have every price range and style imaginable. Wine making in Portugal pre-dates the Phoenicians, Greeks, and Romans. In fact, they have been making wines for over 4,000 years. This independence and isolation has lead to indigenous grapes not found elsewhere in the world, save a couple shared with Spain (Alvarinho=albarino, and Tinto Roriz=Tempranillo). In early May, I had the pleasure of joining a group of five retail wine buyers on a whirlwind tour of Portugal’s wine regions. Our lucky group spent the next seven days discovering the beautiful landscape, forward-thinking winemakers, and incredible wines to be found in this corner of Europe. 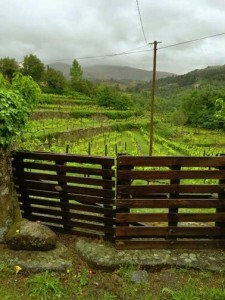 Our trip began in the rainy northern Minho region, where excellent white wines are produced. Varietals such as Alvarinho, Loureiro and Avesso are just some of the varietals that are grown in this lushly green land. Naturally low in alcohol and extremely refreshing, these are wines perfect to stock up on for summer.